Donald Trump says he has donated to many politicians, because he knows how to play the game. I don’t think it’s improper for Trump to support politicians, even if he knows that it’s to some degree to curry favor. Such is the nature of politics, and the reason why we as citizens need to be very watchful of unscrupulous politicians, and those who would wish to corrupt them for personal gain. Trump admits to the latter, and wants to convince Americans, mainly Conservative Americans that as an insider to the game, he’s willing to expose the dirty underbelly of crony capitalism. First, the amounts are tiny. The third largest donation (visible) was to a governor’s race, which was $84,000 to Cuomo. That makes sense, since Cuomo is governor of the state where arguably Trump has done the most business. He certainly didn’t need to donate to Bloomberg, though it should be noted that Trump donated $7,750 to former NY mayor David Dinkins. He got that man on the cheap, apparently. The next think that is obvious from Trump’s donations are they are overwhelmingly to Democrats, and I mean the most radical of Democrats. I can forgive the “nuisance” donations of $1,000 to Jimmy Carter and Joe Biden. But Hillary Clinton, Harry Reid, Terry McAuliffe, John Kerry? 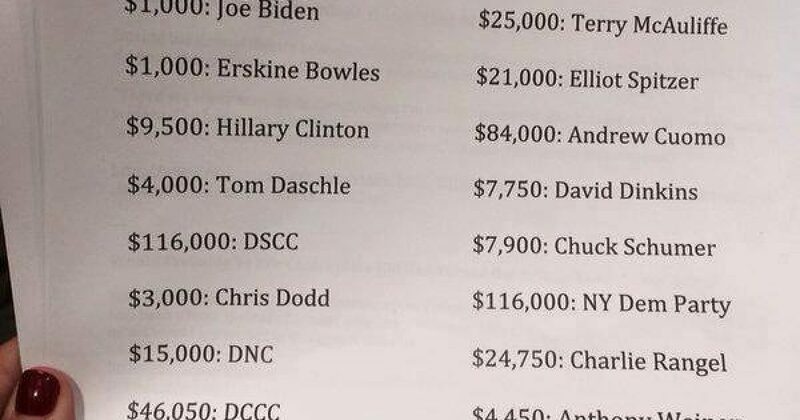 Then, Trump’s largest donations by far, save Cuomo, and the $50,000 to Emmanuel, are to Democrat central. 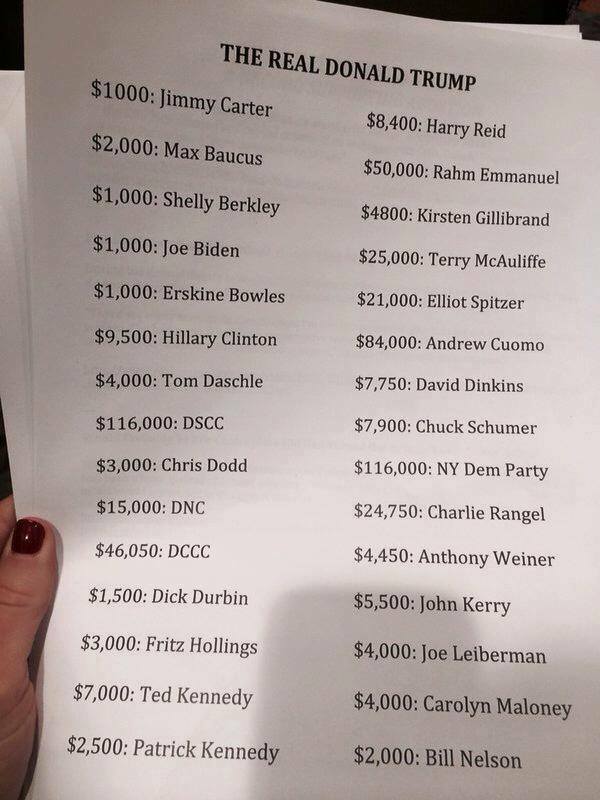 $116,000 to DSCC, $116,000 to the NY Democrat Party, $6,050 to DCCC, $15,000 to DNC? That a lot of Trump-love being shown to Democrats. All that’s missing is a token give to Sharpton’s National Action Network to pretty much put the stamp on this letter. Below is Trump’s donation history through 2015, and the source is noted. As you can see, around 2010 Trump began moving his donations from Democrats to Republicans. It’s for you to determine if Trump had a catharsis around that time, and suddenly abandoned his Democrat tendencies, and started supporting Republicans. From this vantage point, it appears that Trump was more even handed in his donations prior to 2010. As the graph shows, thereafter Trump went almost exclusively Republican, save 2013, where there is a slight blue spot on the graph. As I noted earlier, it’s surprising how little Trump donated to politicians, in the scheme of things. Doing quick math, Trump has donated less than $2 million to politicians over a 27 year period. That’s about $74,000 per year. This is a mere pittance to a guy who is worth $10 billion and made almost $350 million last year alone. When it comes to buying politicians, Trump really does prove he knows the art of the deal. For a pretty good glimpse into the donation patterns of Trump, go here.